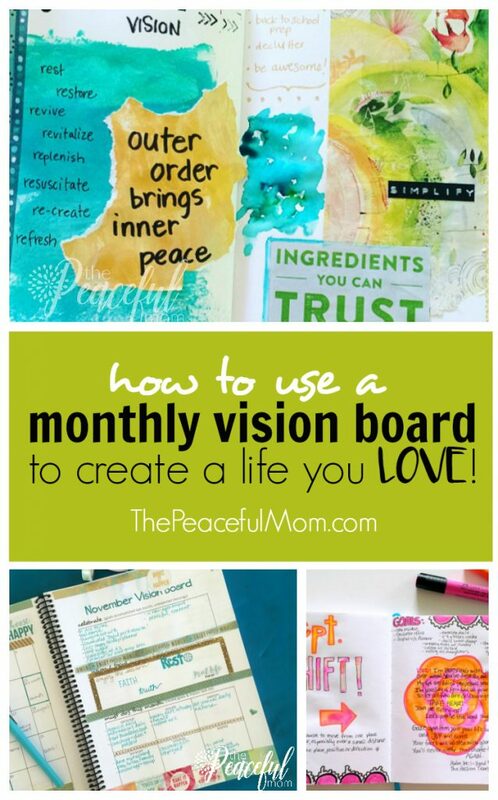 Learn how to make a vision board that works to create a life you love! 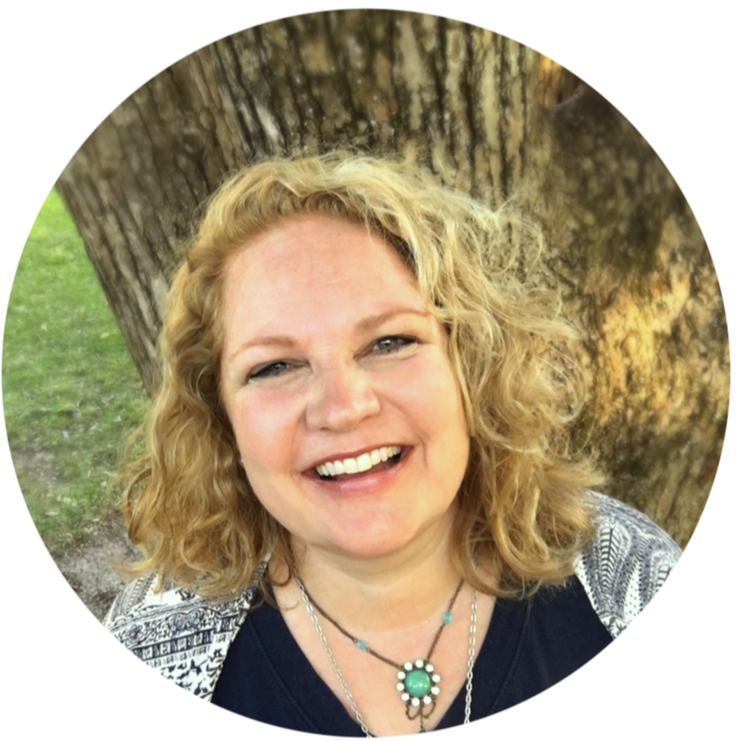 Are you tired of setting goals and imagining a calmer, saner life, but never really achieving it? The secret may be as simple as adapting the way you’re setting your goals. The first step toward creating a life you love is knowing exactly what you want, and an easy way to discover that is to create a vision board. A vision board is simply a collection of words and images that visually represent what you want to bring into your life. 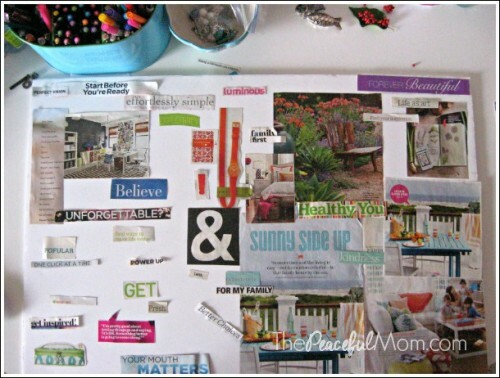 Vision boards enable you to focus your attention and energy on your goals, so you’re much more likely to achieve them. They help you visualize your new reality so you can make it happen. But you need to know how to make a vision board that works. 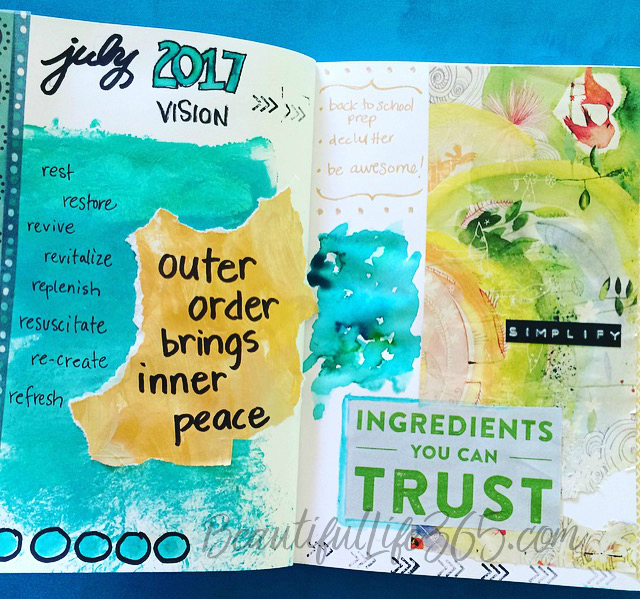 Why Create a Monthly Vision Board? Creating a big vision for your life can be very motivating, but to actually make that vision become reality, you need to break your goals and dreams down into small steps so you can take action on them. 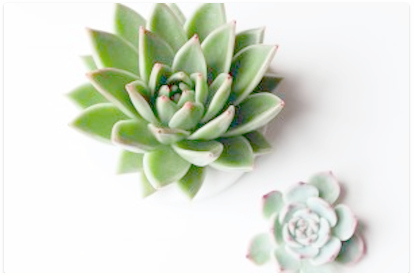 A monthly vision board is a powerful tool that enables you to break your goals down into bite-size pieces so you can actually make progress toward them. I’ve been creating monthly vision boards for years because it helps me to focus on what’s most important for the next 30-31 days and sets me up for success in making progress toward my big life vision. 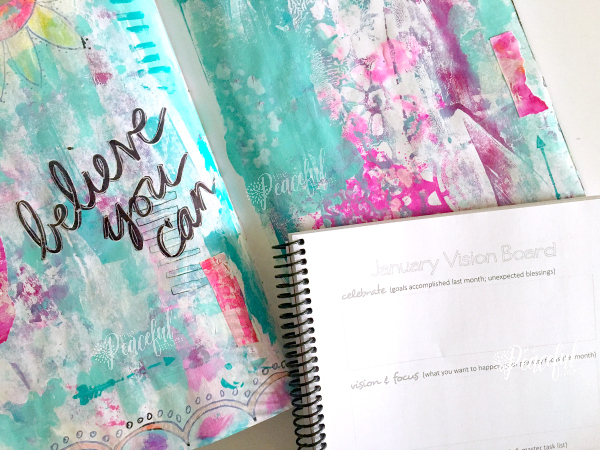 I’ve been using the monthly vision boards in the Joyful Life Planner since 2013, but last year I branched out into a bullet journal (see my bullet journal monthly vision boards HERE). After fully giving the bullet journal a test run, I’m back to using my Joyful Life Planner because everything is already laid out for me and I can simply fill in the categories I want to use. 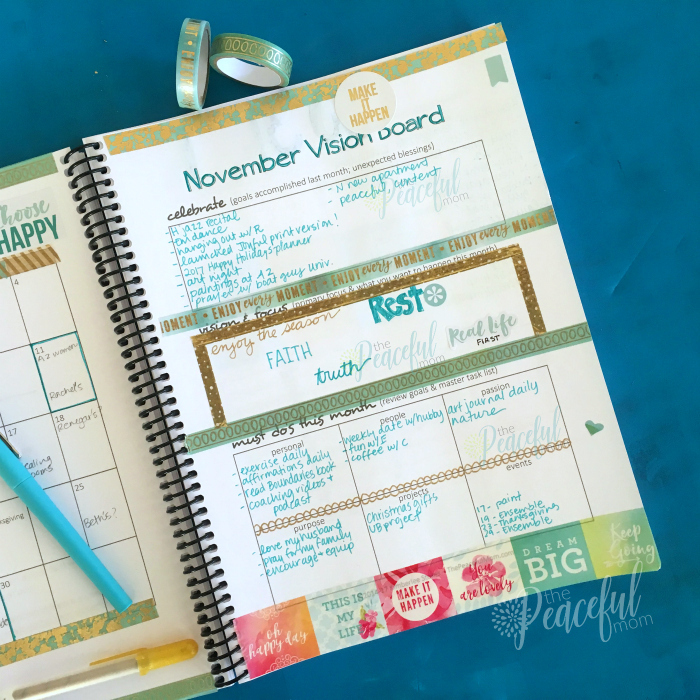 In the first part of your monthly vision board you can review the previous month and celebrate the progress you made, the goals you accomplished and the happy moments that you want to remember. Beginning the month by focusing on the positive is very motivational. I then write words and phrases describing where I want to be in the next four weeks, and I sometimes include photos cut from magazines or doodles. Creating this vision gives me focus and direction, which increases the chances that I will actually accomplish my goals. You should honestly ask yourself what you want rather than creating goals based on what you “should” do, or what others say your goals should be. If you’re a stay-at-home mom and your big goal is to love your babies well, that is what you need to put on your vision board. 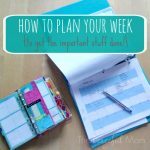 Once you’ve created your vision for the month, it’s time to break your big goals down into specific actions you can take each week to move you toward your goals. It’s important to limit your goals to two or three for each category, or even two or three big goals for the month. A smaller number of goals helps you to focus your efforts which increases your productivity and helps to prevent overwhelm. Accomplishing one small goal is better than being overwhelmed and doing nothing. Consistently creating a monthly vision board has dramatically increased my productivity, focus and happiness. It only takes a few minutes, and the results are phenomenal. I encourage you to give it a try! Share your goals for November with me in the comments. Click here to join the 30 Days to Organized Community!